In a time of crisis almost everyone will be armed regardless of what the government tries to do about it. Having and knowing how to use personal defensive handguns will make survival possible for you and your family. The following five sections should be considered by all preppers no matter what their training or experience levels are. What Would Be the Best Firearm to Carry? Can you shoot and kill if you must? If you are not honest with yourself and buy a handgun anyway and then freeze when it is needed the most, you and your family may pay a terrible price. Before buying any handgun, define your intended purpose and use for the weapon. The next step is to research different handguns that meet your needs. If possible, handle and test fire those handguns that you are considering buying at local ranges that rents firearms or shoot with the same model firearms that belong to friends. When your mind is made up and you are satisfied with your choice, buy the handgun. The best firearm to carry is one that fits your hands comfortably. Your hand should fit the pistol grip so that all fingers will grip the firearm without any fingers hanging in space. If the handgun you truly need and want does not fit your hand properly because the grip is too small, after market magazines that have a finger rest on them can help to solve this problem. Also the shooter’s fingers must be able to safely and easily operate the safety or the slide release. Can you point quickly and naturally when pointing at the target? The handgun should be well balanced and hold on target with ease. If the barrel is too heavy this can make the gun point and shoot low. On the other hand if the barrel is to light, there is a tendency for the barrel to rise a little bit which could cause the gun to point and shoot high. The ammunition caliber of the handgun is very important. Too small of a caliber and the stopping power may not be strong enough to stop and end the confrontation. Many more shots may be needed than you have time to fire off. If necessary, work your way up to larger caliber guns that have the stopping power required to quickly end the confrontation with just one or two shots fired. The best caliber for a revolver would be a 38 Special or larger with the upper end at the .357 magnum. Anything smaller would not have the stopping power needed to end a confrontation. The best caliber for a pistol would either be a 9MM, 40 Caliber, or a 45 ACP. Each of these calibers have enough stopping power to stop any confrontation with the least number of shots fired. It must be remembered that most US police forces use either 9MM, 40 Caliber, or 45ACP in their department issued sidearms. The US Military or UN Peace Keeping Troops carry 9MM or 45 ACP as their issued sidearms depending if the troops are regular troops or special operation troops needed to take care of “Special Problems”. Anything smaller than the 9MM like the 380 ACP, 32 ACP, 25 ACP, or the 22 Caliber would be a poor choice of pistol calibers. They are too light and do not have enough stopping power. These calibers could be used if you had nothing else to protect yourself with and you can also train with them. They are better than nothing. The recoil of the handgun should not be too heavy. 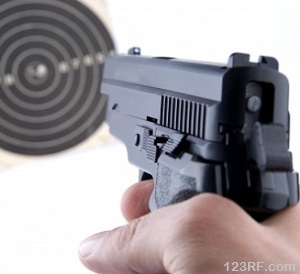 If the recoil is too heavy it can cause the shooter to anticipate the heavy recoil causing them to flinch, close their eyes, or jerk the handgun off target. No matter which handgun you choose, get the best one that you can afford with the money that has been set aside from your budget. Be practical in your choices of handguns. Buy a handgun model with a long history of dependability, safety, and is user friendly. After you have made your preliminary choices of handguns you must compare the cost of the ammunition and availability of it. If the ammunition costs way too much or is hard to locate, consider dropping this weapon from your list. Below is a table of handguns that I would recommend for preppers that are considering a personal defensive handgun for their personal protection during a time of crisis. Each person has their own set of personal requirements for their handgun needs. This is only a small sample of the handguns that are out in the marketplace. 2. Which Handguns Should a New Shooter Consider? Is the new shooter male or female, young or old? Which handguns should they consider for their first personal defensive handgun? For shooters in this category I would be looking to see if the shooters could physically work the slide, hold up the handgun, aim it, safely work the safety, or the slide release. If not I would recommend a revolver which is much simpler to use, operate, and weighs less. For those shooters that can safely handle and operate a pistol I would recommend the following handguns in 9MM. These pistols are well built, dependable, and should give the shooter years of good service. Beretta PX4 – a good compact high capacity pistol, with good balance, stopping power, and mild recoil. C.I.A. Canik55 TP9 – This pistol is new to the market, but tests results show this is a well-built handgun that points easily, has good balance, mild recoil, and good stopping power. FNH-USA-FNS – This is a well-built high capacity handgun that is rugged and very dependable. This pistol comes with 2 interchangeable backstraps for a better hand grip fit. Glock 19 – Is a very dependable, high capacity handgun that has stood the test of time. The Gen4 has the dual recoil spring system and 3 backstraps for better hand fit (small, medium, or large). Ruger SR9 – Like all of the Ruger handguns this pistol is very dependable, easy to shoot, and has mild recoil. Smith & Wesson M&P – An excellent starter gun for the new shooter. Comes with 3 palm sweller grip panels. This pistol is well built, dependable, and comfortable to shoot. For those individuals that have trouble operating a pistol, I would recommend a revolver for their first handgun. Here there are no slides to pull back or safeties to work. With a revolver all the shooter does is aim and shoot at the target. The following are revolvers that I would recommend to the new shooter. Rossi R851 – This is a 38 Special 6 shot revolver that is dependable, well built, and will give you years of good service. It points well, is balanced, and the felt recoil is mild. Ruger GP100 – This is a very dependable revolver in .357 Mag. Which also firers the 38 Special round interchangeably. This revolver weighs in at 45 Oz., but this helps to reduce the felt recoil of the .357 Mag. round to mild. Which handguns should a trained and experienced marksman with a small framed build, with small hands, and being either male or female consider for their Personal defensive handgun? In this category I would recommend the following handguns and calibers in the 9MM, .40, or the 45 ACP. Being a trained and experienced marksman you have been through the basics and have a good idea of what you want for your personal defensive handguns. Beretta Px4 – is a good compact high capacity pistol that comes in three calibers the 9MM, .40, and the 45ACP. The .40 and the 45 ACP are better man stoppers than the 9MM. If you take care of this pistol it should give you years of good service. CZ-75 – This pistol comes in 9MM and .40 and set the standard that all other pistols of this design are judged by. It is very dependable, points well, balanced, and has very good stopping power. Glock 23/27 Gen4 – These are .40 pistols that have a history of getting the job done. The Gen4 has the double recoil spring system that helps to reduce recoil. These pistols also come with 3 different sized backstraps to help give the shooter a better grip on the weapon. Ruger SR1911 – This is a 45 ACP pistol that is made in stainless steel. The design is a classic and is known for its dependability, safety, and stopping power. Smith & Wesson M&P – This pistol comes in 9MM, .40, 45 ACP. The .40 and the 45 ACP are better man stoppers than the 9MM. For a better grip the M&P pistol comes with 3 palmswell grip sizes making it easier for one pistol to fit small, medium, or large hands. Springfield XD – This pistol comes in three calibers 9MM, .40, and 45 ACP. The .40 and the 45 ACP are better man stoppers than the 9MM. This pistol comes in 3”, 4”, and 5” barrel lengths. This is a very safe and dependable pistol. This pistol comes with a trigger safety and a grip safety. For those individuals that cannot operate a pistol or would prefer a revolver, I would recommend the following revolvers. Ruger GP100 – This is a dependable well-built revolver that will give you years of good service in .357 Mag. or 38 Special interchangeably. The recoil is mild to heavy depending which loads are used. Taurus Judge – This revolver comes in two barrel lengths a 3” and a 6.5”. It shoots either 45LC (standard velocity only) or 2.5” or 3” .410 shotgun rounds interchangeably depending on the version. The recoil is heavy, but it will end any confrontation quickly. Which handguns should a trained and experienced marksman with a large framed build, with large hands, and being either male or female consider for their personal defensive handgun? In this category, I would recommend the following pistols in 9MM, .40, or 45 ACP. Beretta 92SF – This is a larger pistol for the 9MM. It is good for those shooters with larger hands. The 9MM round is used by many police and sheriff departments throughout the country. Also this pistol is the main sidearm for the US Military and NATO forces. The 92FS is very dependable and will give you years of good service if properly maintained. I also recommend this weapon since it is one I carried for over 15 Years as a police officer without malfunctions or breakdowns. CZ-USA P-09 Duty – This pistol comes in either 9MM or .40, with the .40 being the better of the two calibers. The .40 caliber is a heavier bullet traveling with greater velocity and has better knock down power. The P-09 Duty is a very dependable and accurate pistol. FNH- USA- FNS – This pistol comes in either 9MM or .40 with the .40 being the better of the two. It is a very well built pistol that is high capacity and is very dependable. The FNS comes with 2 replaceable backstraps for a better grip on the weapon. Recoil is quite manageable. FNH- USA- FNX45 – This is a large capacity 45 ACP which holds 15 rounds of 45 ACP. It is well built and very dependable. For a better grip it comes with 2 replaceable backstraps. The 45 ACP is quite manageable in this firearm. A good weapon for the 45 ACP enthusiast. Glock 23/27 Gen4 – These are .40 pistols that are known for getting the job done. These pistols come with the double recoil spring system that helps to reduce felt recoil. These pistols come with 3 different sized backstraps that give the shooter a better grip on the pistol. Smith & Wesson M&P – This pistol comes in 9MM, .40, and 45 ACP. The .40 and the 45 ACP are excellent man stoppers with the 9MM in third place. The M&P pistols are very dependable with high capacity magazines with a good work history. To better fit the shooters this pistol comes with 3 palm swell grip sizes (small, medium, and large) to better fit the shooter’s hand. Ruger GP100 – is a dependable and well-made stainless steel or blue alloy 6 shot .357 Mag. (shoots 38 Special interchangeably) revolver. The recoil is mild depending on which loads are fired. If maintained this revolver will give the owner years of good service. Taurus Judge – This is a 5 shot very unique and special revolver that fires both the 45LC (standard velocity only) or the .410 shotgun rounds interchangeably. Depending on which version you buy either the 2.5” or 3” shells will determine how heavy the recoil and muzzle blast will be. This weapon comes in both 3” or 6” barrel lengths and either stainless steel or blued steel versions. After buying your handguns training is essential for the shooter to learn how to safely and correctly shoot and carry handguns. Training should start before you get your first handgun and continue for as long as you own guns. It is a lifelong responsibility that must be taken seriously. The more you practice and train the more muscle memory is obtained until the action of drawing and shooting a firearms is instinct and does not require much thought. There are many types of handgun lasers on the market today. Some are compact enough to fit in the chamber and are activated each time the trigger is pulled by a firing-pin activation switch. The LaserLyte trainer cartridge comes in four calibers .380, 9MM, .40, and 45ACP at a cost of $104.95, which quickly pays for itself in ammunition savings. LaserLyte plinking cans or bullseye target would be needed to score hits. The LaserLyte Bullseye Trainer Kit comes with a blue hard plastic pistol, laser, and a bullseye target for $309.95. This system uses motion picture scenarios to portray shoot do not shoot incidents using lasers to keep score of the hits rated as misses, kills, or injuries. During my police career I trained on this system many times and it is as real as it gets without really being in a gun fight. This is an excellent training system that teaches the student to quickly identify and shoot at the target at a rate of so many shots per number of seconds. It teaches the student to draw, aim, and fire at different distances that might be encountered in a true gun fight. Like all training systems the more you practice, the better you get with accuracy and muscle memory. This is a live fire true to life shoot do not shoot training exercises. As you walk the alley different targets with different situations appear in windows or doorways that the shooter must decide to shoot or not at a moment’s notice. If you shoot the bad guy you get points. If a friendly gets shot you get negative points or disqualified. The ammunition that you use for training should be about the same bullet weight and velocity as your carry ammunition. In pistols use full metal jacket bullets for training and jacketed hollow points for the carry ammunition. In revolvers use lead or copper round nose bullets that are the same weight as the jacketed hollow point bullets for the carry ammunition. Many ammunition manufactures are now selling boxes of ammunition that combines FMJ and JHP ammunition so the shooter can practice and have carry ammunition in one box. All preppers should have, know how to handle, and shoot handguns safely. It is the owners’ choice of which handgun fits his/her needs and will be carried for family and self-protection. Some people will choose a high capacity pistol in 9MM, .40, or 45 ACP over a revolver. Those who choose the revolver may do so because they have trouble using the slide release or the safety. But training is a lifelong job that starts before you get your first handguns and lasts pretty much all of your life. Remember: know what is behind your back stop and be safe! Fred Tyrrell is an Eagle Scout and retired police officer that loves to hunt, fish, hike, and camp with good friends and family. He is also a champion marksman (rifle, pistol, shotgun) and has direct experience with all of the major gun brands and their clones. Fred refers to himself as a “southern gentleman” – the last of a dying way. He believes a man’s word is his bond, and looks forward to teaching others what he has learned over the years. You can send Fred a message at fred.tyrell [at] survivopedia.com. Written by: Fred Tyrell on February 4, 2015. Last revised by: James Cole, our reviewer, on June 22, 2017. Previous PostHOW TO SURVIVE MARTIAL LAW! – DETAILED GUIDE!